Spending lots of time around children this weekend, there were numerous occasions where parents would say to the child “what do you say?” after something was given to them. The child replied with a quiet and shy “thank you” though clearly not having any idea what it meant or why they were repeating this simple phrase. It made me think about how and when and most importantly-why- we learned to say thank you as children. After any birthday or other present receiving holiday, as a child, I dreaded “thank-you note writing day.” There was nothing worse than spending precious play time writing boring thank-you notes. As adults while we have continued the verbal squawking of “thank you” in most circumstances, the written “thank you” as a skill and practice that was forced upon us in our childhood, seems to have gone way of the dodo bird. Not only in our personal lives, but “thank you” seems to be missing in professional relationships—especially when it comes to the official “thank you for the interview” note. 1. Differentiation: This simple act will differentiate and make you stand out from the rest of the job-seeking pack which is crucial in this competitive job market. 2. Respect: Officially saying thank you shows respect to the interviewer. You DO appreciate the time he/she took to meet with you so let them know that! 3. Recap: This is a great opportunity to recap and re-affirm why you are best for the job. Briefly summarize one or two items you feel truly make you the best candidate for this job. 4. Elaboration: The note provides opportunity to mention something that was forgotten in interview- sometimes in the heat of the moment you forget some critical facts or question, but this can be a time to bring them up. 5. Impression: This note is a chance to put your name in front of the interviewer one last time and leave them with a lasting impression that you are professional, prompt, respectful and the best candidate for the job. 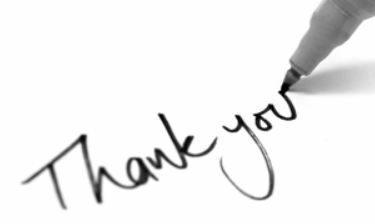 According to jobinterviewwisdom.com, only 10 % of candidates send an official thank-you note after an interview. Don’t fall into the 90% that don’t! There aren’t too many things that are under your control in the job seeking process, but this simple step is! An email thank-you may be more appropriate than a hand written note, so chose whichever way you feel best fits the person, job or company. And to prepare, visit this recent article from CBSnews.com for some helpful tips on how to write an appropriate business thank-you. Happy job hunting and THANK YOU!